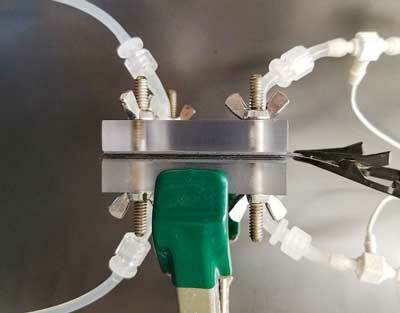 (Nanowerk News) Providing safer drinking water to those in need may be a little easier. According to Penn State researchers, a new desalination technique is able to remove salt from water using less energy than previous methods (Environmental Science & Technology Letters, "Low Energy Desalination Using Battery Electrode Deionization"). To combat this problem, Logan, and colleagues Christopher Gorski, assistant professor of environmental engineering, and Taeyoung Kim, post-doctoral scholar in environmental engineering, have come up with a desalination method called battery electrode deionization (BDI). BDI improves upon standard capacitive deionization (CDI) techniques by eliminating the regeneration stage and lowering the voltage required to complete the process. Standard CDI techniques desalinate water by separating the water’s ions. A typical CDI cell consists of two electrodes attached on opposite sides of a flow channel. The electrodes capture the salt ions through electrical exchanges that occur when an electrical current is applied to the cell. The cell is then regenerated by releasing the salt ions in a second cycle by alternating the direction of the applied electrical current. Since CDI does not require membranes and has lower energy requirements than other popular methods, it is becoming a competitive technology for removing salt from water. The problem with CDI systems is that they are limited by low salt adsorption when using the typically applied 1.2 volts. Increasing the applied voltage does improve the salt adsorption, but it also increases the potential for unintended side reactions that waste energy and can create permanent electrode corrosion. In the team’s newly developed BDI system, a custom-built flow cell utilizes two channels. The channels are separated by a membrane and two identical battery electrodes are secured at each end. To test the cell’s effectiveness, the team fed each channel with a salty solution at a specified flow rate while applying a constant electrical current to the cell. Several current densities were used, depending on the number of membrane stacks. The researchers then reversed the cell voltage flow when it reached a low of -0.6 volts or a high of +0.6 volts. The team discovered that the BDI system effectively removed the salt at levels consistent with CDI, while using only an applied voltage of 0.6 volts. Furthermore, the low voltage required and materials used helped prevent unwanted side reactions, achieved greater desalination abilities and consumed less energy than traditional CDI. Since the team created simultaneous production of desalinated and concentrated water in two channels, it also circumvented the two-cycle approach, so the system no longer needs to go through the regeneration stage. Additionally, they found that stacking additional membranes between electrodes reduced energy consumption even further. Although the current configuration is not suited to desalinate extremely salty water such as seawater, the results show that the BDI technique could be effective as a low energy method for brackish, or slightly salty, water, such as groundwater, or for desalinating water before it enters treatment plants. “There is nothing that inherently prevents its use with seawater, it's just that as water gets saltier and saltier, there are other issues that we have to contend with, such as increased energy consumption and membrane fouling, that may reduce its utility relative to other approaches,” Logan said. The researchers now plan to work on scaling up and improving the stability of the system.